The internet is real life. There’s no longer a distinction between what you do online and how you act in the real world. This is true for people of all ages, as well as for corporations and higher education institutions. The public gets their information online and uses it to form their views of the world. The Edelman Trust Barometer reports that one of the most trustworthy people in the United States is “a person like me.” Fifty-four percent of people deem the most credible spokesperson is someone they can relate to. They trust a person like them posting on the internet almost as much as an academic expert from your campus, and much more than they trust CEOs or government officials. Social listening provides us with unfiltered access to the internet reality, via online conversations that happen every day. You can’t control the narrative about your campus, but you can and should be aware of the conversation—it's a source of intelligence for how you interact with the marketplace and, of course, participate in the conversation. Social listening isn't part of your social media strategy—it is your strategy. Real-time insights related to the conversation about your campus or other topics of interest can inform marketing strategy, recruitment, enrollment and retention strategy, alumni engagement strategy, and crisis management. Other industries like retail and airlines have embraced the power and value social listening brings to the business (an analysis of online trends is why we had to endure the Unicorn Frappuccino), and they certainly understand how it impacts their reputation. Most campuses are conducting social media monitoring—watching for posts to their Facebook page, or for someone to tag them on Twitter or Instagram. This is important work, but today it’s akin to checking email or responding when someone calls your name on the street. To not do it would be bad business and just plain rude. The practice of social listening—searching the public social web for mentions or conversations of interest to you—is much more wide-reaching. It’s the digital equivalent of knowing what students say when they walk through campus, overhearing conversations among attendees at campus events, tagging along with alumni as they discuss their experience with friends at a party, or joining the family around the dinner table. It’s the ability to know when and how people talk about you, not to you. Unless you’re gathering everything being said about you online, in every place you can realistically access the data, you’re not engaging in social listening. You’ll never know what you’re going to find—or what you’re currently missing—until you start listening. 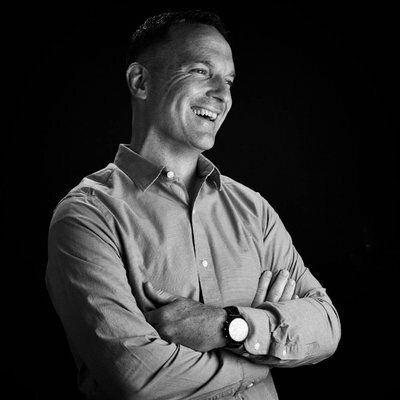 At the 2017 Now You Know Brandwatch conference, Will McInnes, Brandwatch CMO, said, “Companies using social listening and social intelligence tools have access to the largest publicly available archive of human thought.” For an industry like higher education that continually innovates to educate the leaders of modern society, this opportunity can’t be ignored. Social listening doesn’t mean the same thing to everyone. Our research and conversations show this is especially true in higher education. In April 2017, Campus Sonar surveyed 233 higher education professionals. Seven out of ten said they currently use social listening in their office, but over 60 percent of that group also said they searched manually for relevant messages using Facebook or Twitter. This was eye opening—a manual approach only offers visibility into a small fraction of online conversations and very limited analysis opportunities. A manual approach is akin to social media monitoring, but social listening dives deeper to search all conversations. Every day there are literally millions of public posts on the internet, coming from Twitter, Instagram, blogs, discussion forums, news websites, YouTube, Reddit. These posts represent real-life experiences of people all over the world. Because of the wealth of information that's available, social listening can be overwhelming and minimally valuable without a strategic approach. But higher education is beginning to embrace strategic social listening. If you accept the idea that the online conversations you gather from social listening are a representation of real life, then strategic social listening is real life—transcribed, sorted, and analyzed to provide your institution with the insights it needs to support data-driven, audience-centric strategies. When strategic social listening aligns with established campus goals, it can result in outcomes such as increased conversations with prospective students, more effective marketing materials for your target audience, or increased alumni engagement and giving. Our strategic approach to higher ed social listening illustrates how to use data analysis to explore campus goals and develop actionable outcomes and impacts. Effective query-building: Search queries are the backbone of strategic social listening. A query is a request for information from the software database that defines the scope of the conversations you want to collect. Exhaustive sources: An effective query pulls from an exhaustive database of online conversations. The software you use determines the sources your query pulls from. Flexible analysis tools: You can use your analysis tools to examine your online conversations at a macro level and drill down into individual conversations when necessary. By combining social listening strategy with comprehensive queries, sources, and analysis tools, you end up with reliable, persuasive, and actionable social listening insights that can help you reach your strategic goals. Takes a skilled analyst with the right tools days, not months, to go from research question to insights. Collects data instantly, so you can change your approach (or research question) and gather more data. Allows you to conduct a trend analysis or benchmarking study without waiting months or years, then use the same research method to track changes as they happen. Combines quantitative and qualitative data. Uses an analyst's human eye to draw conclusions from data that software isn't able to. Understand your audience so you can engage with them and the topics they're interested in can inform strategic efforts. Using social listening to analyze your audience allows you to capture authentic conversation and uncover actionable insights. Improve yield rate over time and conserve campus resources to engage strategically with target prospective students. But in order to engage with prospective students, you need to know who they are. You can use social listening to find prospective students and families who are talking about your institution, not just to it. These are some of the opportunities that you may otherwise miss. Increase donations by adjusting the messaging of ask campaigns to align with topics that resonate with alumni. 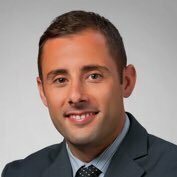 Dr. Jay Le Roux Dillon uncovers what matters most to alumni in his Alumni Identity research. Social listening helps you uncover how alumni feel about themselves in relation to their institution, which offers insight into how to influence and increase donations. Evaluate demand shifts and respond to course and program feedback on an organizational level to meet the educational needs of your market. For example, you can analyze online reviews to capture thoughts about programs or processes that may be frustrating to students, thus affecting retention. Preserve and measure reputation as you track the volume and type of complaints or observations that are solved, arise, or trend seasonally online. Social listening allows you to gain a clear understanding of what the general population is saying about your campus. Beloit College used social listening to track changes over time in relation to their efforts to modify or improve their reputation, ultimately using the data to create a reputation management strategy. Achieve better outcomes by using the intelligence you've collected to inform engagement strategies for the short- or long-term. In the short term you can improve your customer service with online intervention or uncover communication gaps. For the long term, you can use it to gather data that informs specific strategic campaigns or track your institution's performance over time toward its goals. If all of this makes sense to you, but you still need to explain it to your campus leaders, we've got you covered! Our strategic framework will help you put social listening into the context of real campus goals and it's impact on the bottom line. Whether you work in marketing, alumni affairs, admissions, advancement, or elsewhere on campus, we can help you communicate with your boss, grand-boss, and even your board. Our resources can help with any need, and we've worked with all shapes and sizes of campuses—from those that have successfully advocated for a social listening budget for software, their people resources, or a partner like Campus Sonar. Social listening isn't something you have to tackle on your own. 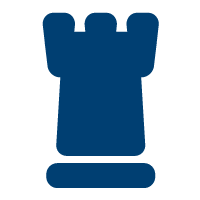 Campus Sonar is your partner on campus, providing you with the expertise, analysis capacity, strategic input, and commitment to innovation. By partnering with us, you'll gain a meaningful contributor to your team—as if we're team members on your campus. We work with you to understand your current environment (strengths, weaknesses, opportunities) and short- and long-term goals to design and execute customized social listening research to support and inform your needs. If you're already doing social listening, our consulting services can help you manage your current program or act as a sounding board. We have specialized analysts who understand higher education needs and have an industry-specific understanding of the value and composition of social listening data. The importance of the human eye is vital in our analysis process. We spends hours each week categorizing and analyzing hundreds of mentions each day to look for trends, changes, and cultivate content for a weekly report with insights that meet your goals. Campus Sonar can help you make a difference and drive successful authentic engagement strategies on your campus. Dr. Liz Gross does an extraordinary job of demystifying social listening for her audience. She takes a largely scientific process and makes it digestible, leaving the reader with actionable strategies that can be implemented immediately. In admissions marketing, we are always looking for ways to differentiate ourselves. Look no further. 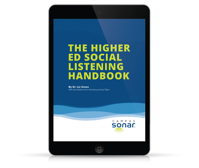 The Higher Ed Social Listening Handbook is your guide to implementing social listening strategy on campus. The handbook walks you through why social listening matters in higher education and key metrics, how-to guides, and over a dozen campus case studies related to social listening for crisis management, student engagement, brand management, influencer marketing, and audience research. Download it today!